Steampunk: Science fiction set in an alternate version of the historic past, especially 19th-century England, and involving advanced technologies usually based on steam power. The creativity of Steampunk, an alternative universe where the internal combustion engine was never invented, extends to literature, movies, music, art, home goods design, and fashion. 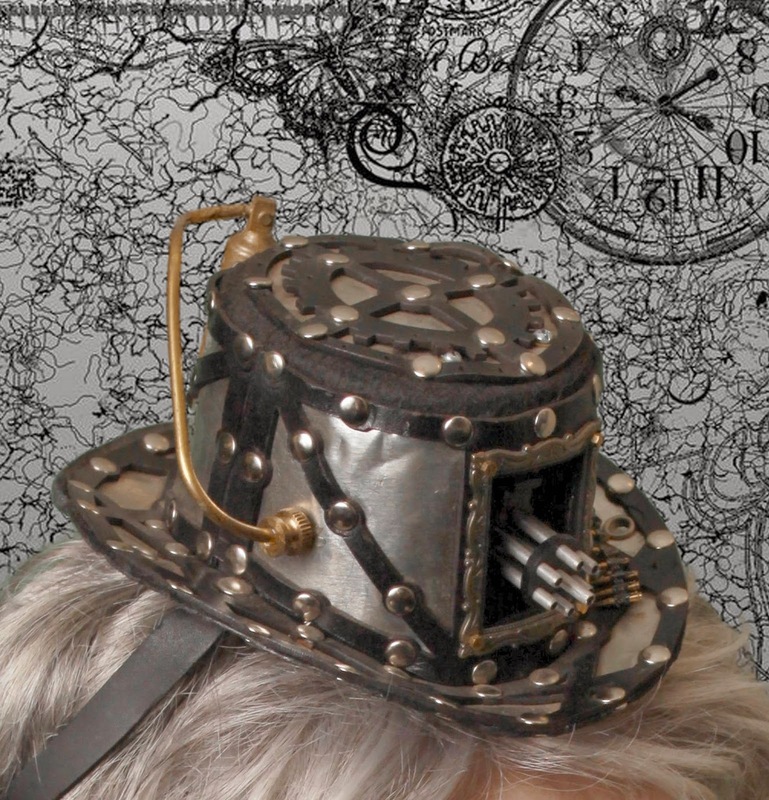 The basis for Steampunk fashion is 19th century and from there the creativity that is Steampunk expands. Accessories to a 19th Century costume can be as imaginative as you desire to portray your persona. I've crossed into the Steampunk alternative universe for several events. 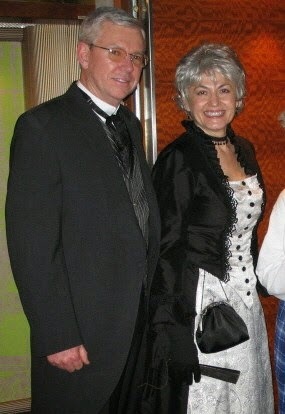 In 2007, as I was just beginning to sew my own costumes, I purchased this black silk and silver metallic brocade late-bustle gown from an online retailer who had a great reputation in sewing Victorian costumes. 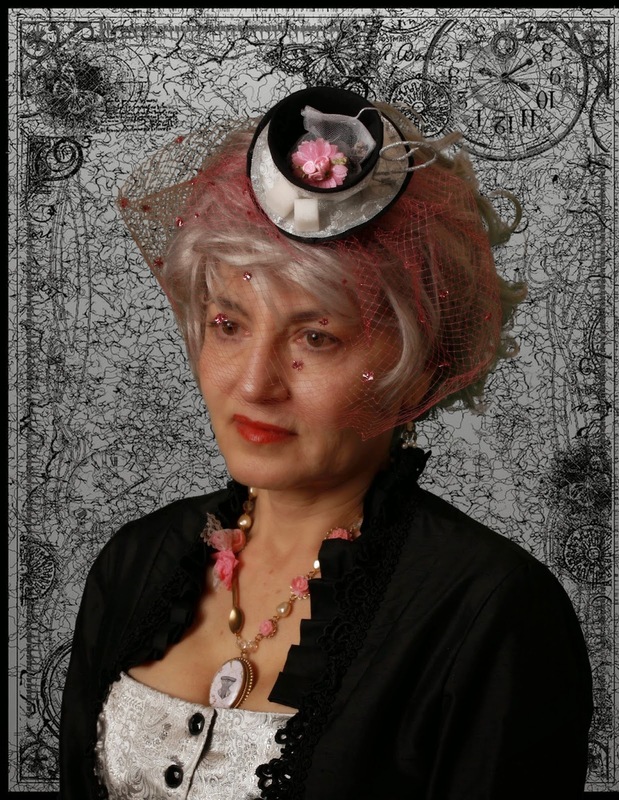 I wore it on a Victorian Dance Cruise in early 2008.
and made a teacup hat with a vintage pink veiling. 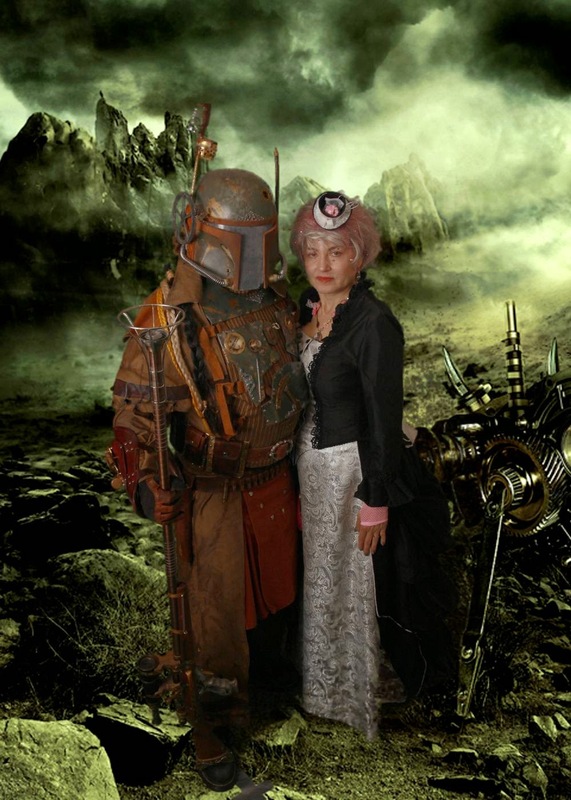 This photo is Steampunk Boba Fett escorting the sweet little old lady (me) across the big bad Universe. Such a gentleman! and with a facial bindi and a few more accessories I became a Time Portal Guardian. So when I received notice that the dance mistress of our Victorian Dance Cruise was performing at Steampunk unLimited at the Strasburg Rail Road in Lancaster, Pennsylvania at the end of September I knew that I wanted to attend. 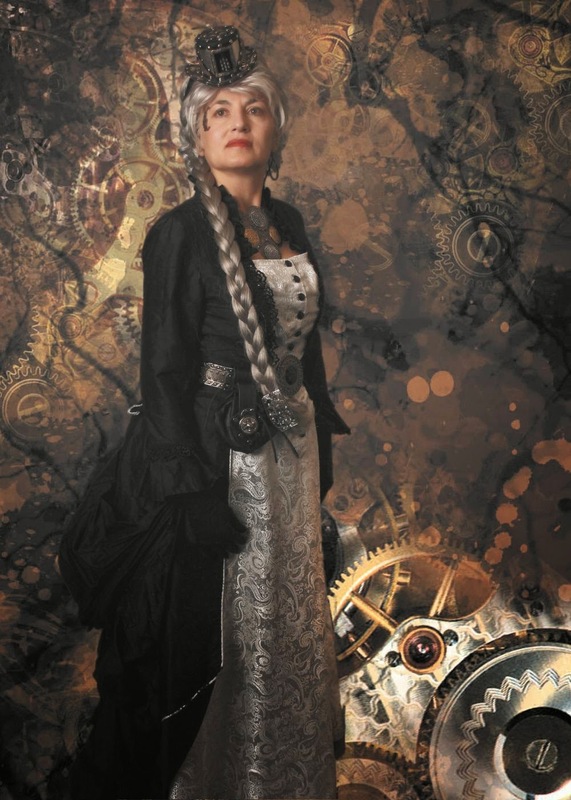 I also knew that it was perfectly appropriate that I keep tradition and Steampunk the black and silver gown once again. In my stash is some black dupioni silk and a silver metallic brocade that is a very close match to this gown. My plan had always been to make a ballgown bodice to wear with the skirt and now is the perfect time. In searching online for sewing patterns for a unique bodice suitable for a Steampunk Victorian Ball I find a pattern from Harlots and Angels that will be perfect. I learned the basics of corsetry just this past spring and am ready to tackle the new pattern. The e-pattern goes together very well, and I pin my pieces onto the dressform to see how the pattern assembles. A few adjustments against the corset pattern I have already made which fits me perfectly, and I'm ready to sew the black/white striped cotton lining, the white coutil, and the black silk and brocade. I've ordered a gunmetal busk, gunmetal grommets, and black lacing and I'm nervous but excited to sew the new corset bodice. But I'm pressed for time as this next photo is taken on Monday, September 22nd and I leave on Thursday evening, September 25th. On one hand it seems crazy to put myself in this spot (but I can always wear the other bodice), but sometimes it's good not to have too much time to anguish over a project. Once the busk is in I'm breathing easier. There isn't extra fabric to recut anything so no mistakes allowed! And I'm still contemplating how to/if I should trim. Before I start to sew the next panels I have a brainstorm and decide to mimic the revers on the sides of the skirt. I cut 4 extra of panel 2 in black silk, create piping identical to that on the skirt, sandwich the piping between the black panels and sew it all with panel 2 to create revers. Now here is where things get really crazy. On Thursday I'm still setting grommets and finishing the shoulder straps. Which means I haven't tried the finished corset bodice for fit. Everything is packed (I think) when my puppy, Tasha, starts to act strangely about her right ear. In the chaos of those last minutes I've forgotten to pack my other bodice! So as my roommate, Randi, and I arrive in Pennsylvania on Friday afternoon I'm madly lacing my new corset bodice and sewing the jet buttons on the revers and shoulder straps. We manage to get ready and catch the first steam locomotive train ride just in the nick of time! The Victorian Ball is a huge success and we dance all evening! I've had an excellent time! And did the corset bodice fit? Yes! Here are photos I took when I got back home so you could see some of the detail. There is a modesty panel under the lacing and the panels below the lacing are left open. Corset flossing where the steel boning ends throughout the corset bodice. Piped revers to mimic the skirt. Striped lining. How historically accurate is it? Based on the Steampunk concept of 19th Century, it is accurate. The sewing methods and most of the fabric are period correct. Steampunk Cinderella gets a new gown just in time for the ball! swooooon that gown is georgeous! Thank you, avantgarbe! It was wonderful to wear! Adding the black revers to mimic the skirt was genius. Perfect for steampunk and it matches so nicely it looks like it was intended bodice for the skirt all along. Thank you so very much, The Dreaded Seamstress! Sometimes being short of time and fabric forces a solution that magically works! 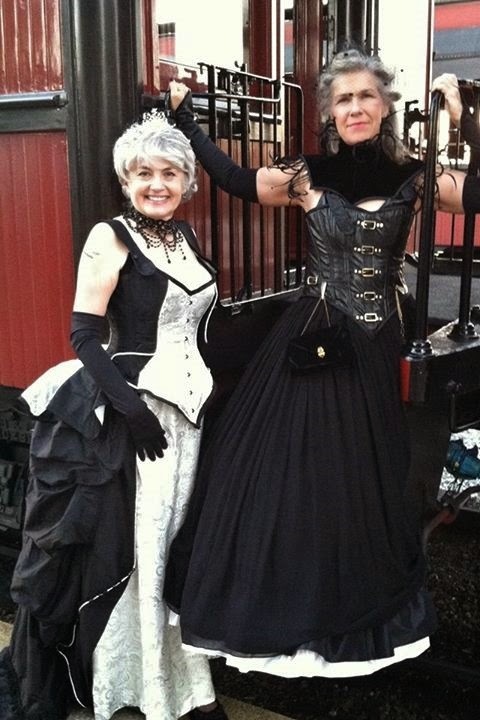 Oh how totally wonderful you look in your Steampunk outfits Jeanette!! I LOVE them all! You also bring a very delicate class to the genre...very well done! Thank you so much, Gina! I'll be posting the other costumes I wore in another post but they tended to be a bit on the softer side as well. It was a lot of fun! Absolutely marvelous! I think you should just send it to me! Also, LOVE that braid you wore in the earlier incarnation of the gown. Wow is that great looking! Thank you, Kat! I should send it to you as you would wear it so well! The braid was fun and I've worn it twisted and up several times since. All in fun! Doing some VERY belated catching up on HSF challenges and associated blog posts - stunning bodice, and you look fabulous in it! Oh, I completely understand, Black Tulip! I've been trying to catch up as well! Thank you for your sweet comment!